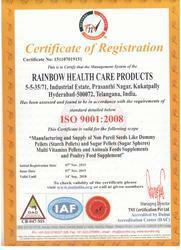 Established in the year 2009, we, “Rainbow Health Care Products”, are a prominent name involved in manufacturing and exporting of Electrolytes move, Detergent Grade move, Spirulina Pellets move, Growth Promoter move, Aquaculture Feed move, Amino Acid Pellets move, Multivitamin Pellets move, Dietary Supplements move, Zinc Sulphate Pellets move, Human Nutraceuticals move, Chlortetracycline Feed move, Pharmaceutical Pellets move, Effluent Water Treatment move, Animal Feed Supplements move, Poultry Feed Supplements move, Industrial Detergent Enzymes move, Lycopene Combination Pellets move, Milk Producer Feed Supplement move, Non Pareil Seeds or Placebo pellets move, Dried Ferrous, Zinc Sulphate Pellets. Processed at our end, these products conform with international quality standards. Post processing, these products are rigorously examined on varied parameters to ensure their flawlessness and offer the esteemed clients best-in-class health supplements. Further, the offered range of products is provided with proper and hygienic packaging, so as to retain the original properties. Available in varied quantities, these products are highly appreciated for their accurate composition, purity, and safeness. Strictly monitoring the production process, we pay utmost attention towards the quality aspect of the offered range of product. All our latest installed machines support us in meeting the bulk and variegated demands of the clients in an effective way within the scheduled time. 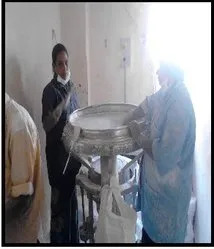 The business activities taking place at our premises are managed by a team of diligent and qualified professionals. These professionals make use of their detailed knowledge of chemical and herbs to offer a safe and effective range of supplements, seeds, and pellets. Further, our processed products are stored in a hygienic warehouse, which is connected to varied modes of transportation for timely delivery of consignments. 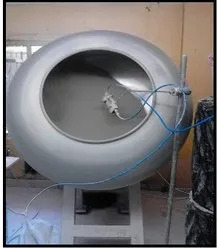 Owing to the sophisticated facility, ability to meet bulk orders on time and quality products, we have been able to gain the trust of numerous loyal patrons. Under the visionary guidance of our mentor, 'Mr. Trinadha Kesava', we have been able to reach the pinnacle of success. His business acumen, brilliant managerial skills, in-depth knowledge and constant motivation have helped us to gain an edge over our competitors. We have hired a sincere and skilled team of professionals, which support us in having streamlined working and timely completion of the organizational tasks. Mastering in the field of medicines, these professionals hold vast experience of the industry. Moreover, our experts understand the exact needs of the clients and offer a product line accordingly. The employees of our firm are provided with regular training sessions to keep the workforce updated with the advancements in technology and changing market conditions. We hold a strong stand in this cut throat era of competition due to the quality products offered and on-time delivery of the ordered goods. Our transparent business policies, ethical trade practices and ability to serve the clients exactly according to their needs have enabled us to gain the trust of numerous patrons across the nation.